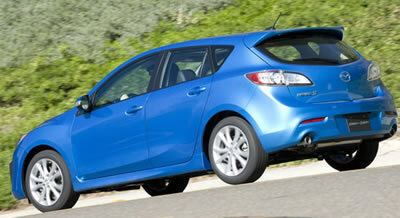 So it was with gusto that I tackled the brand new Mazda3 Sport, the souped up, wagon version of the base 3. It sports a fresh new look and a list of standard and optional equipment that made my head spin considering the car's price. The first thing I noticed is the happy "I'm here to serve you" grin on its front end. It's simultaneously cute and a bit off-putting in that it reminds me of Tow Mater from Pixar's "Cars". Fortunately, I live in an area where front license plates aren't required or the "Mater meme" would have been complete. Other than that, the zippy new Zoom-Zoom looks great, with nice character lines on the side and taillights that are modern and handsome. 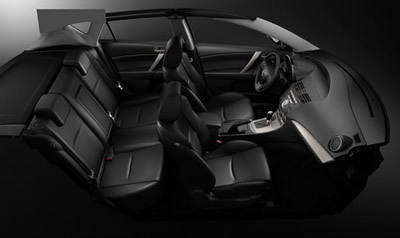 Mazda calls it an "emotional design that takes on an even richer expression and more dynamic stance" than the older 3. They also focus on "Agile driving performance (that) strengthens the sense of oneness between the driver and car, and provides an enhanced sense of control" as well as "Progressive environmental and safety features that support 'Sustainable Zoom-Zoom'". And that, in a nutshell, is the new 3. I loved it. Premium 10 speaker BOSE Centerpoint surround-sound audio system. SIRIUS satellite radio is available as well. My test 3 Sport had all of this stuff, plus leather, a sunroof and just about anything else you could imagine, yet according to Mazda's U.S. and Canadian websites it still tipped the financial scale at just over $22,000 U.S./$26,000 Canadian – a relative steal considering what you get. And if that doesn't get you smiling, there's always that grille that makes people think you're smiling…. Base 3's are motivated by a two liter DOHC 16-valve four cylinder engine rated at 148 horses @ 6500 rpm and 135 lb. ft. of torque @ 4500 rpm. My Sport model came with a 2.5 liter four banger that puts out 168 horses @ 4000 rpm and 167 lb. ft. @ 6000 rpm. I'll always take additional oomph, and while 168/167 isn't world-beating, Mazda makes it work really well. You don't get pushed back into your seat like you would with an extra hundred horses or pound-feet, but the car goes like a scared rabbit anyway. One advantage of only 167 lb. ft. is that you don't get the outrageous torque steer I experienced on the last generation Mazdaspeed 3, which makes you hang on for dear life when you goose it. Power gets to the front wheels via either a five speed or six speed manual transmission, or an optional five speed Sport mode automatic. My test unit had the six speed stick, thankfully. I had trouble finding first gear several times, almost reminding me of an old MGB I had in which the synchromesh was practically gone, but other than that it shifts well. The stick is also mounted farther back on the console than I expected and it felt a bit strange at first. I got used to it quickly, though, and ended up liking its placement immediately at hand. The 3 handles beautifully, thanks in great part to its newly tweaked Macpherson strut front suspension (it also "sports" a multi-link rear). Braking comes via four wheel disc brakes with ABS - and it has excellent feel, as does the rack and pinion (with Electro Hydraulic Power Assist) steering through a tilt/telescoping wheel. The steering wheel also includes controls for the audio system and a well-thought-out cursor control thingy for the info/nav screen that's mounted up high and out of the way just below the windshield. That little screen seems a little strange at first, but after driving the 3 for a couple of days I came to appreciate its eye-level location, as well as the straightforward operation via the steering wheel-mounted controls. The cabin is a terrific place to do the business of driving. My test unit included leather trim, with heated seats up front and a power-adjustable driver's seat with memory. 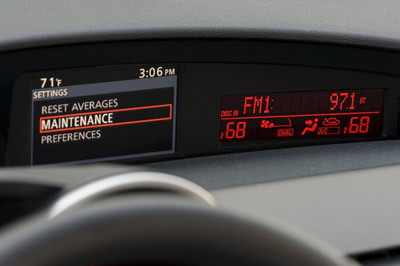 Instrumentation is analog where it should be (speedo and tacho) and digital where it counts (info center, etc.) and Mazda has rotated the speedometer scale so it now runs from "eight o'clock to four o'clock", which is more standard and easier to gauge than the previous 3's "6-2 o'clock" configuration. The small size of the LCD screen means you'll want to use the nav system's voice prompts, but they work really well and that meant I didn't have to squint at the screen when I should have been watching the road. The voice recognition works very well, too, better than in some more expensive vehicle's I've driven recently. Ditto for the Bluetooth's interfacing with my cell phone. The sunroof is a pretty good size, and while it lets in a roaring noise at highway speeds it thankfully doesn't go "Whup whup whup!" like some do. The 3's glove compartment is very deep and holds a surprising amount of junk. My torture test is to try putting my rather large digital camera into such bins and in the case of the 3 it fit so well I forgot it was there for most of my week with the car. Rear seat ingress and egress is better than it might look from the outside, considering the comparatively small doors. Two people can sit there quite comfortably (three in a pinch), with good foot and knee room if the people up front aren't related to Andre the Giant. The rear side windows retract all the way into the doors, too. Only the driver's window features auto down/up capability, just like only the driver's seat is power-operated. About the only things I didn't like about the new 3, and they're really minor, is where Mazda has mounted the handles on the insides of the doors – not the door latch lever, but the big handles you can use to drag the door closed when you're inside (and passengers can use to hold on for dear life when you're cornering!). They're right in the way when you want to reach the window and mirror controls. Another omission, considering how much other stuff Mazda stuffs into the 3, is a rear view camera or parking assist front and rear. And while the hatch can hold plenty of stuff (and of course the rear seats split and fold down), the cargo cover is stiff and hard and, at least in the case of my tester, black. This, when combined with a bright day and sunglasses, led me to bash my forehead on it while unloading stuff. My lawyer will be in touch with Mazda very soon. I never go into a Mazda review expecting great gas mileage, figuring that you end up paying for "Zoom-Zoom" one way of another. Yet I averaged just under 25 miles per gallon during my week of combined city and highway driving, including some decidedly non-economic (i.e. "spirited") driving. In all, a good compromise between mileage and fun. Safety equipment includes dual front airbags, side airbags and curtain airbags, dynamic stability and traction control systems and the usual bevy of belts and stuff. To sum up: if you want a small car that's reasonably priced, extremely well equipped for the money, and that's a blast to drive, check out the 2010 Mazda3. You may end up smiling as much as the car does.